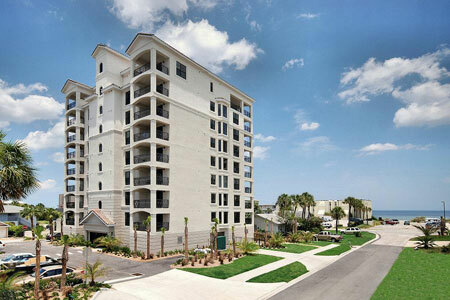 Ocean 9 Villas condominium in Jacksonville Beach, Florida. Ocean 9 Villas is a new oceanside condominium located on 9th Avenue South just one block from Jacksonville Beach. Completed in 2007 by Auchter company, this 9-story building features 15 residential units, only two condos per floor. Each residence has private elevator access, beach-level storage unit and ground level assigned covered parking. Amenities include community pool and spa. Enjoy spectacular sunrises, miles of soft white sand beaches, and a short walk to restaurants and entertainment. Ocean 9 Villas offers elegant coastal living with a wide array of lavish interior appointments including spacious owner's suite with a large walk-in closet, luxury baths with walk-in shower and garden tub, gourmet kitchen, granite countertops, stainless steel appliances, custom cabinets, Kohler fixtures, dining room with bay window, 9' ceilings, 6" crown molding throughout, CAT-5 wiring, fire safety sprinkler, 310 S.F. ocean view terrace on the east side and 110 S.F. sunset views from the west side. Richly finished millwork and gleaming marble floors complement a richly sumptuous yet sleekly refined living environment comprising over 2,700 total square feet. From the living room's handsome built-in cabinetry to the dining room's cross-beamed ceiling, to the master suite's lavish spa bath, meticulous attention to detail is shown in every aspect of the superlative design and craftsmanship. Every room of the spacious and well flowing floor plan opens onto wraparound balconies looking out to the sparkling Atlantic Ocean and the tranquil Intracoastal Waterway.